‘To think … iFani trolled ME. Fast forward. My album went LEGIT platinum and he hasn’t been seen since,’ he tweeted. Just when we thought Kiernan ‘AKA’ Forbes was done throwing shade at other musicians, he struck again, this time at iFani. In a series of tweets, AKA said last year’s drama made him stronger, and said he believesd he’s the “most thick skinned, resilient, human being walking the face of this earth”. He says his career and love life are “beaming”, despite the criticism he has received on social media. AKA’s love life came into the spotlight late last year after his baby mama, DJ Zinhle, outed Bonang Matheba as the woman he was having an affair with. Twitter responded with anger, constantly chastising the couple, saying they would not last. That has not been the case, however, as his love life is “beaming”. Responding to a fan who tweeted: “Y’all been saying that you will humble AKA when it comes to awards and sales coz of his ‘attitude’. Yet he keeps winning”, the DreamWork hitmaker said he had been waiting for the “God of Twitter” to strike him down. He then started talking about people who thought they had him where they wanted him, mentioning iFani, who once tweeted him a golden handshake picture when his album reached gold status. “To think … iFani trolled ME. Fast forward. My album went LEGIT platinum and he hasn’t been seen since. That’s life,” he tweeted. He, however, admitted that though he has been “liberated from people and their opinions”, they do get to him once in while, though he will never respond to any negative comments directed at him. 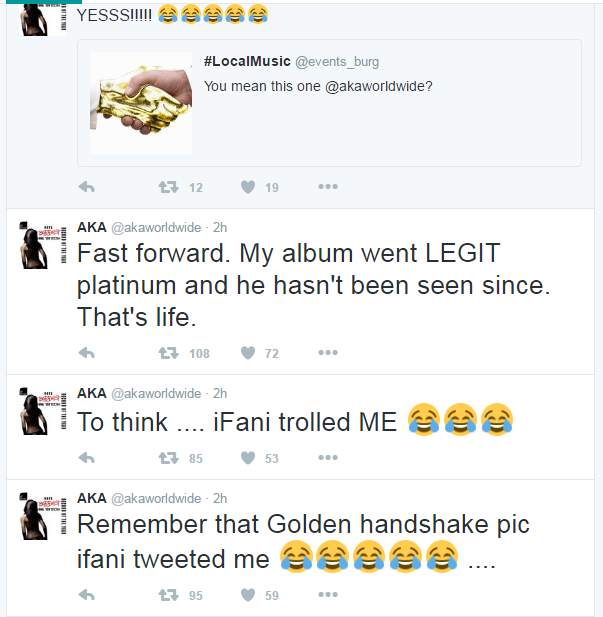 A screenshot of AKA’s tweets.